Teachers of Denver Public Schools (DPS) are walking out for higher pay Monday in the first teachers’ strike the city has seen in 25 years. The Denver Post reported the Denver Classroom Teachers Association (DCTA) did not show up for negotiations with the school district Sunday night following failed contract talks on Saturday. The union said it would plan to strike and not resume negotiations until Tuesday. “We will strike Monday for our students and for our profession, and perhaps then DPS will get the message and return to the bargaining table with a serious proposal aimed at solving the teacher turnover crisis in Denver,” Henry Roman, DCTA president, said in a statement. The school district and the union agreed on a starting salary of $45,800. As USA Today reported, school officials attempted to increase pay for some teachers by creating bonuses for high performance, but the union wants all teachers to obtain base raises and cost-of-living increases, regardless of performance. With the “ProComp” system, launched in 2005, teachers obtain raises for helping students achieve higher test scores or for working in more difficult schools. Denver Public Schools officials announced Sunday that all of the district’s schools will remain open Monday. According to the Post, the school district has added 300 additional substitute teachers to its regular roster of 1,200 substitutes. Further gaps will be filled by 1,400 central administrative office employees. Henry Waldstreicher, a senior at George Washington High School, said he will picket with his teachers at 6:30 a.m. but be in class by 7:25 a.m.
Waldstreicher said he supports his “incredible” teachers but admitted he is worried that, without an agreement after a few days of striking, students like himself will get behind in their studies. Nick Onofrio, a parent of a third-grader said he is disheartened by the hostility expressed between the union and the school district. 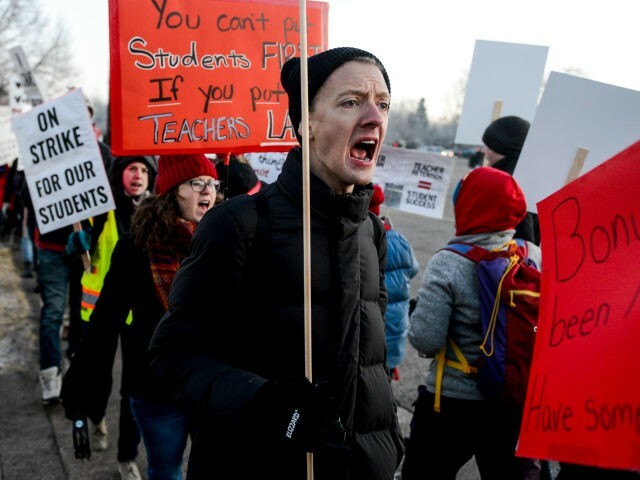 Central office employee Alex Maddock, who will be serving in the schools during the strike, echoed concern about the animosity between the union and the school district. While he supports the teachers, he believes the union’s handling of the negotiations was not appropriate.